Marco 625 Souwester Review | Peninsula Marine Ltd. The Marco 625 Sou’wester was added to the already extensive Marco range to fill a much needed gap in the line up. Barry Thompson checks out the second boat built. One of the real neat things about this job is I get to go to a lot of interesting places to carry out boat reviews and some are surprisingly very close to home. So when I headed to Thames recently to meet Alan Thompson of Peninsula Marine to take the new Marco 625 Souwester for a run, I assumed I would be boating in the muddy waters at the bottom of the Firth of Thames. Not so, as Alan took us back inland to the very small village of Turua, on the banks of the vast flowing and equally as brown Waihou river. It was one of those calm mid-winter days with an almost cloudless sky, with very little wind, but a cold chill in the air. Being in a hardtop boat was perfect. The Waihou River was formerly named, Thames River, by Captain James Cook, but later changed to Waihou river. The river flows north for 150 kilometres from the Mamaku Ranges past the towns of Putaruru, Te Aroha, and Paeroa, before reaching the Firth of Thames at the south end of the Hauraki Gulf near the town of Thames. Near the entrance is the famed Kopu Bridge that until the new one was opened a few years ago, was the scene of massive traffic holdups every summer. The old bridge remains alongside the new one and as yet no one has decided what to do with it. In its lower reaches, the river and the nearby Piako River form the wide alluvial Hauraki Plains. It is navigable for small boats as far as Paeroa, 20 miles from the coast. While Marco Boats have been building the Souwester 600 (LOH 6.00m) and the Souwester 650 (LOH 6.50m) for some time, there has until now being nothing to fit the gap between. However, while the Marco 625 Souwester is pitched in the middle, it’s more aligned to the 600, being similar in design, albeit a little longer, wider and with a marginally shallower vee. Put the two side by side and the only noticeable difference is the cockpit of the Marco 625 Souwester, which is 250mm longer than the 600. Both boats retain the same flat sheerline, hardtop and internal layout. They are also able to be transported on single-axle unbraked trailers and require no more than 115hp to achieve good performance. The 650, on the other hand, is overall a much bigger boat, requires a larger horsepower outboard and needs a tandem trailer and a bigger tow vehicle. Consequently is into a whole different budget bracket. You are paying around an extra $NZ???? for the added cockpit space. Personally I think it is well worth it and that extra length gave the Marco 625 Souwester a more balanced look. The 650, on the other hand, is overall a much bigger boat and needs a tandem trailer and a bigger tow vehicle. 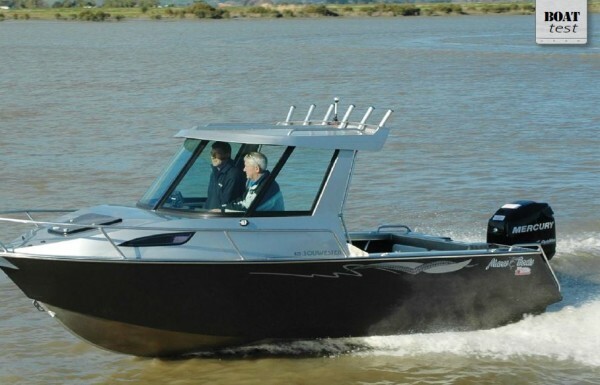 Like the 600, the hull bottom 5mm and the sides 4mm, with everything CAD designed, precut by a Hamilton based company and then pressed and assembled by Marco Boats at their Morrinsville factory. On the water, the performance is very similar between both boats, with our test boat, only the second 625 built, powered by a Mercury 115 Optimax. The Marco 625 Souwester does carry a slightly wider beam – 2.29m, compared to 2.28m for the 600 Souwester and the deadrise is 15 deg, whereas the 600 is 16 deg. Hardly anything that is going to make a difference to the performance and handling. The extra waterline length certainly provides the Marco 625 Souwester with a longer surface to slip easily onto the plane and extra underwater surfaces always help when the water’s roughen up. We had less than an hour till high tide so the river was running very fast, which meant for the speed runs it was necessary to take an average both ways. The difference was quite noticeable with around 2.5mph difference. Average top end with the Mercury 115 Optimax, running a 19” 3bld Vengeance prop, was 40.5mph. I found a nice cruise speed around 4000 rpm @ around 26.5 mph, when the Mercury Smartcraft guage indicated we were using 17 lph. At our peak of 5600 rpm we burned around 38 lph. This dropped back very quickly to 28 lph @ 5000 rpm and 36 mph. While testing a boat this size on calm water didn’t give me much of a chance to comment on its rough water handling, I did like the positive response to the helm in the calm and the lack of excess heel in full turns. Hardtops are susceptible to wind and the Marco 625 Souwester is no different. With no tabs fitted I opted for the ‘poor man tabs’; I got my passengers to move to the other side of the cockpit. Worked perfectly and cost nothing! From the rear of the helm and passenger seats forward, the layout of the 525 is identical to the 600, with the same Sandbrook curved glass screen and alloy hardtop. This is a boat you can drive standing or seated, although I would like to have seen a sliding seat base to locate the best driving position. Controls and instruments are readily to hand and bracket, or flush mounted screens have good spaces for easy viewing while driving. I was impressed with the exceptional clarity through the curved tempered glass screen. You have the option of a fixed wiper, or I find giving the screen a good coating of Rainex does a great job. Sliding side 2windows are an option. Finding something unique in a boat this size and style is always hard, but Marco have got a little winner in the 625 with their fold down bunks. If you are pitching the Marco 625 Souwester boat as an overnighter, but the cabin berths are only 1.5m long, what do you do. Simple, hinge the bottom half of the cabin’s rear bulkheads and extend that to 2m. The backrest acts as the extended squab cushion and the helm and passenger seat footrests double up as support brackets. Very cool, very simple and makes perfect sense on a small boat. Another interesting feature of the Marco 625 Souwester, was the way in which the sub frame for the vee berths is all pre cut and folded and then tack welded to the chequered plate flooring, which extends right through to the bow. There is limited storage under squabs and in side trays, with a larger access hatch to the foredeck area for anchoring. A portable or plumbed head can be fitted under the forward squab and if you like your privacy, a curtain or more solid door arrangement can be added to the aft bulkhead. There is provision made for an auto capstan, with plenty of fall in the anchor locker for a rope chain combo. One of the main reasons to extend the 600 Souwester was to increase the fishing space in the cockpit and this certainly noticeable. Yourself and three mates will not feel crowded. While the standard boat comes with a full transom, you do have the option of a wide walkthrough. Our boat had a port side walkthrough with drop in sliding rear splash panel and a couple of extra large So Pac hatches covering storage and battery areas. holders. Plus there is still plenty of space to add radar or TV domes, aerials and GPS receivers.